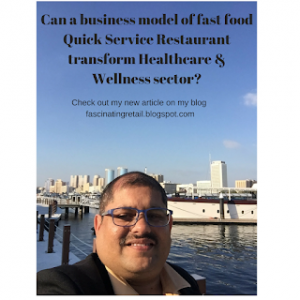 14 Apr Can a business model of fast food Quick service restaurant transform healthcare & wellness sector? My inspiration to write on this topic came when I was approached by a senior personnel of a reputed healthcare chain in India, resulted in our discussion about their future plans and industry overall. My brief interaction with the senior management of this reputed healthcare chain inspired me to look at healthcare sector more closely as it is already billion dollar industry itself & growing. With modern times as the life expectancy rate has increased and with the advent of the modern sedentary lifestyle that we all are living in modern cities have given birth to a new breed of Specialty healthcare clinics & centres/hospitals. I initiated my research limiting myself to Eyecare clinics and my findings have truly amazed me with new age speciality eye care clinics and their business model. I limited my scope of the study to two big Eyecare speciality clinics in Southern India, which are now spreading their wings in other parts of the country as well as in the Middle East and the Far East countries. (I would not like to divulge names of these two eye care chains since the brand name is not important but how they have transformed their business model is what I am going to highlight in my article). Both these chains were started by legendary family icons who were specialist doctors & now being managed by 2nd and 3rdgenerations and it all began with a noble cause which has formed the SOUL of the organization & gave them their WHY (Purpose). Starting small but with limited resources at hand but withclear VISION in mind that they need to provide eye care to the poorest of the poor in economic strata. Ideation & concept came from the business model of fast food chain business model i.e. turning out millions of dishes (burgers/pizzas) in shortest possible time. Serving good food in the shortest time is the main premise of any Quick Service Restaurant. These Eyecare speciality chains have adopted the same style of operations i.e. bringing Economies of Scale in their operations by treating the maximum number of patients which drives their fixed costs to go downwards (benefit from economies of scale operations) resulting in bringing down the cost of treatment. These chains treat eye illness like cataracts at so subsidized costs and sometimes free to poor patients who could not afford the high cost of treatments. Their costs are compensated by those patients who could afford to pay for the treatment or are covered by health insurance. Patients are told in advance as to where their fees or cost of treatment would be utilized so that there is transparency which results ingaining TRUST from higher economic strata who feels happy and satisfied that at least their money which he/she is paying towards medical treatment is being utilized to give treatment to poor patients who could hardly afford the treatment. GIVING selflessly to society is the main objective of Spiritualism. Such a noble thought, which has turned these brands into million dollar brands and still growing. – ERP systems keep records of all patients which are made available at the click of a button to any doctor at given point of time. Patients diagnosed with cataract are given appointments for next day surgery. – Automated queue system; clear indicators of the free patient facility and Paid patient facility. – Daycare clinics wherein patients need not stay post-surgery but can go back to his/her home same day. Eliminating defects in any process – from manufacturing to transactional and from product to service is the main promise of Six Sigma processes which has helped these speciality eye care clinics to scale up faster than any other service provider. Treating Operation theatre as Production/ Assembly line i.e. while the earlier patient is being operated in OT, the second patient is being prepared in the preparatory room next to OT so that there is minimal wastage of time and this process brings Operational efficiency thus bringing the cost down. Challenge comes when you have to manage both technical staffs (doctors) along with paramedical staffs and admin teams. How to bring all of them together and work in a synchronized way is a big task itself. One of my core learning while studying their business model is the fact these successful eye care speciality clinics chain have mastered the way of Internal communicationright from senior management to lowest ranks of helpers. Everybody knows what is going on and what needs to be done, they all work as a single unit. Management has ensured that every member of these clinics shares same VALUES and Purpose (Why) as that of their founders. Their values & ethical principles have been aligned and imbibed in each and every staff member. If you analyze, this is the main principle behind Robert Kaplan’s “Balance scorecard” theory. I would end my article by saluting these founders & visionaries of these Eye care speciality clinics operating in Southern India and their current management who is not only following their founder’s VISION but also showing the world a NEW WAY OF DOING BUSINESS ETHICALLY. You can reach me on riteshmohan@yahoo.com in case this topic excites you.